Where There Is Tragedy We Can Bring HOPE | B the Change. I was born on September 11 and feel honored each year to have the opportunity to look back on what happened on that day in 2001, not because of what the terrorists destroyed, but because of how Americans rose up to support each other, and how the world reached out to support the United States. I am so moved by the work being done by the New York Says Thank You Foundation (NYSTY), which was inspired by a five-year-old boy whose father lost his business partner in the World Trade Center. When Jeff Parness’ son saw on television a news story about wildfires in San Diego, California and the loss of many people’s homes, he asked his dad if they could bring their toys to the children who lost theirs. This triggered a road trip across the USA that started in New York City where Jeff and his family still live. Stopping in cities and towns across the nation, where Jeff asked communities to donate toys, which were added to the U-Haul that eventually delivered all the toys to San Diego. Dozens of television and radio stations, newspapers and community blogs shared the story, and by the time Jeff and his son got back to NY, word had gotten out about this extraordinary way that Jeff found to heal his own spirit after the devastating loss of one of the most important people in his life at ground zero. 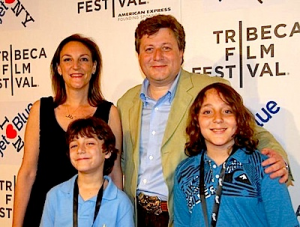 Jeff Parness, founder of the New York Says Thank You Foundation, with his wife Sandra Hauser and their sons Josh and Evan at the premiere of the documentary film. And then, a miracle happened! While Jeff was parked on a NYC street, an off-duty fire chief saw the truck, and asked Jeff to explain. This was the spark for the New York Says Thank You Foundation. Why? The chief, and then many other NYC firefighters, police, first responders and citizens wanted to find a way to say thank you to the tens of thousands of their peers who came to help heal a city in unspeakable pain. Every year since, these same founders and thousands more volunteers have traveled to states around the US, rebuilding boy scout camps or even sometimes entire communities. A stunning documentary premiered at the Tribeca Film Festival telling this incredible story. 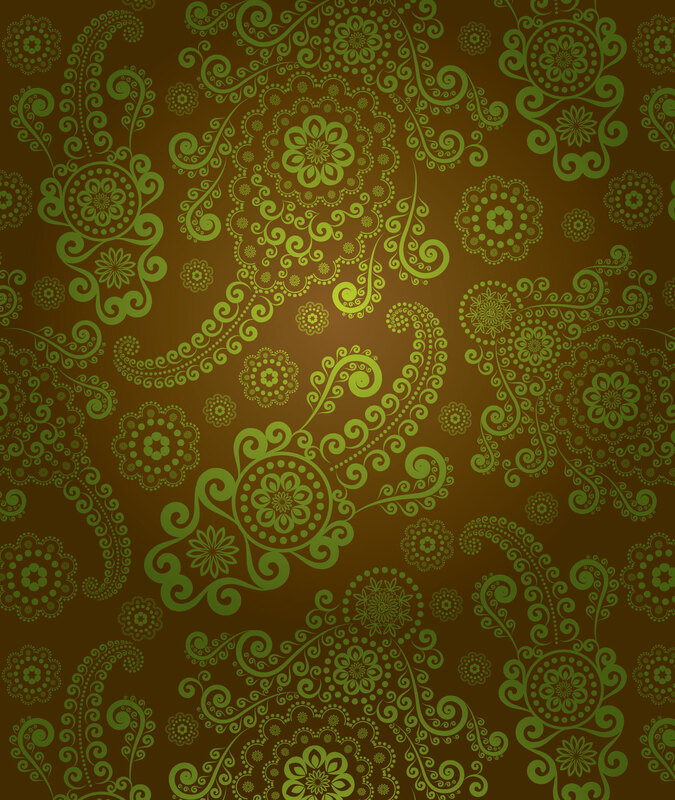 Storytelling became the lifeblood of the organization, with Jeff Parness leading the way. 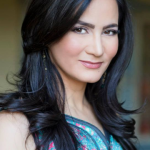 NYSTY estimates that over 300 million people have learned about the power there is in healing by helping others through the many beautiful stories that continue to happen. When my company (GENBAND) volunteered as part of our global day of service in June 2014, I witnessed one of NYSTY’s great successes – their Stars of HOPE program – firsthand. A group of us from GENBAND headed out to a beach town on Long Island one sunny summer day, to help rebuild two homes destroyed by Sandy through an effort lead by NYSTY’s team to help support the first responders impacted by the super storm. Along the sandy footpaths, there were Stars of HOPE painted, cheering on the community. 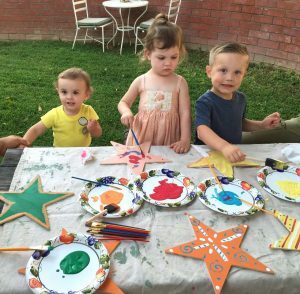 So you can imagine how delighted I was to learn recently that the NYSTY team has launched a new program, making it possible for anybody to order supplies to paint their own Stars of HOPE and this year, my 14-month old grandson Hudson and his friends painted stars from their Box of HOPE. It is never too early to engage children in discussions about love, creativity and compassion; our children are ambassadors of HOPE and positivity for the future. 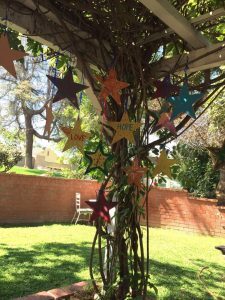 If you are a grandparent like me, or a parent, an aunt, an uncle, a neighbor, a friend – consider going online and purchasing your own box of stars, which you can then paint and place in your own community or mail to another you wish. 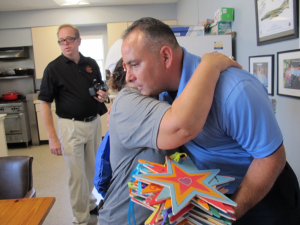 The organization has also organized the placement of Stars of HOPE around San Bernardino, California to comfort the community, as they head toward the one-year anniversary of the mass shootings. And if you are an educator, an administrator at any school, including elementary, middle school and high school – and you are looking for an amazing experience for your students and their parents – consider supporting the Stars of HOPE program. This year, Stars of HOPE were made all across the country for the folks in Orlando. Some were made by the survivors in San Bernardino and delivered by NYST volunteers including Elsie, who lost her daughter Maria on 9/11. For Mikey’s 22nd birthday, his mom had a Stars of HOPE party for all the first responders that have come to their home to help with Mikey’s care. 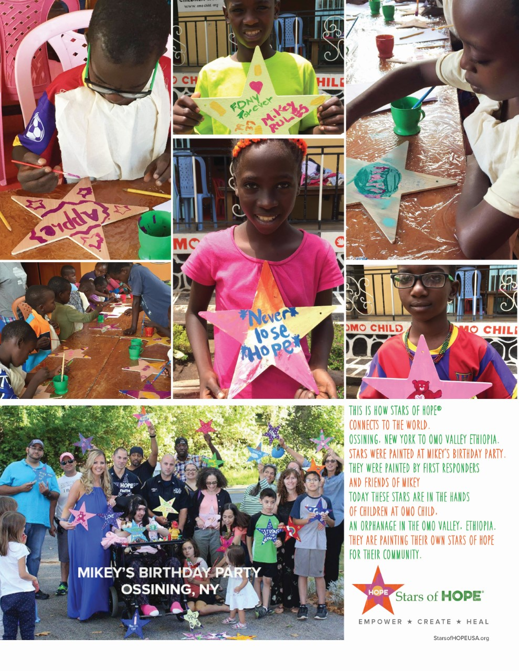 Some of the Stars from Mikey’s party were sent to an orphanage in Ethiopia. Jill Adkins, executive director of the foundation, has worked with Mrs. Walker, a second-grade teacher from Council Bluffs, Iowa. 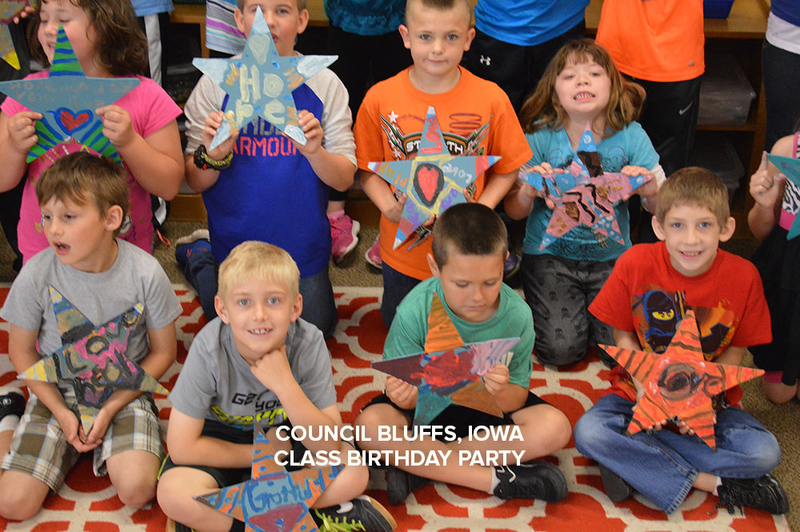 She has made Stars of HOPE for the past two years with her class. This year, the class made them in the memory of the memory of a police officer who passed away. 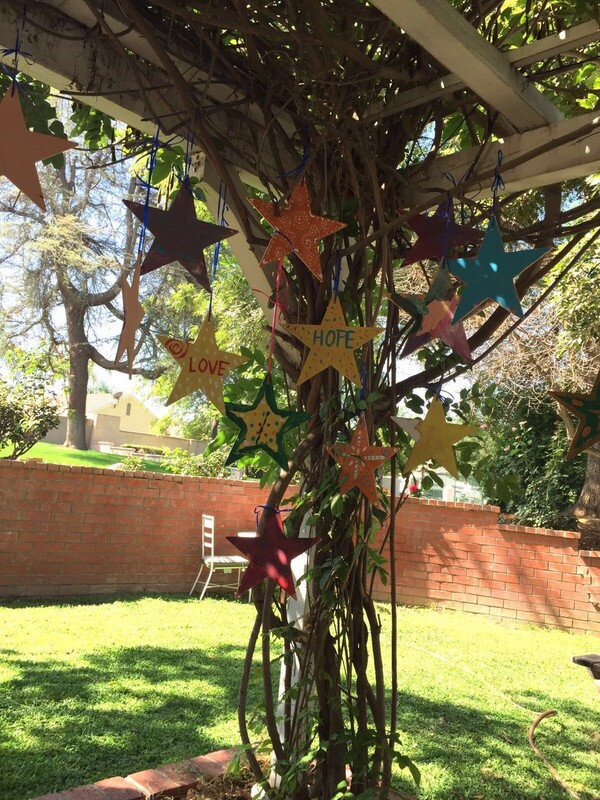 The children painted the stars and wrote notes to Jill that expressed the gratitude and learning they enjoyed from this Stars of HOPE experience. One of my friends even donated a box to the assisted living facility where her parents live, here in Southern California at the Brookdale North Euclid home in Ontario. The activities director was thrilled with the idea and plans to participate on an ongoing basis, as it is also never too late to do something that can make a huge difference in people’s lives. Artistic talents reside in each of us, and painting these stars is a way to meditate on what it is like to be human – to be part of this world – to be fragile – to be afraid – to be strong – to be active – to be compassionate – and to be a part of the solution. With millions of stars in the heavens lighting up the night, these humble but magnificent works of art can light up even the darkest moments and send a message that we will never give up HOPE. This is what my America looks like.